Shaw Communications Inc. (SJRb.TO) beat analyst estimates for profit and revenue in its fall quarter, powered by its Freedom Mobile wireless business. Since acquiring Wind Mobile, Calgary-based Shaw has spent heavily to improve the capabilities of its wireless network, which operates in the more heavily populated portions of Ontario, Alberta and British Columbia. Shaw's ability to offer the iPhone and other Apple products starting in late 2017 helped improve Freedom's hardware sales and revenue per user throughout 2018. "Our efforts and focus over the quarter were aligned with our strategy, as we continue to move up-market and add higher-value customers," chief executive Brad Shaw told analysts on the company's first-quarter conference call. Freedom's average billing per subscriber was up 12 per cent at $41.99, he said. 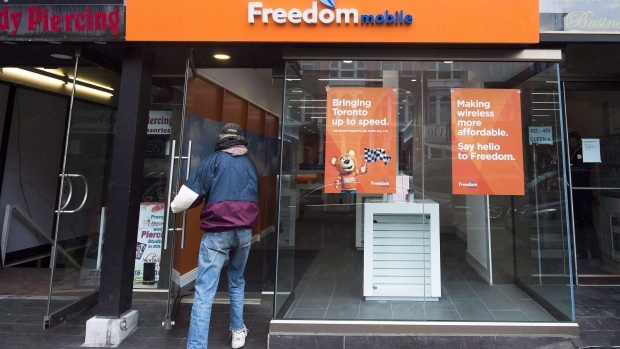 In addition, Freedom improved its retention of existing customers, with churn of its post-paid subscriber base falling to 1.28 per cent -- a significant improvement but still high by industry standards. Brad Shaw said his management team was also pleased with the performance of its wireline business, which he said "has made some important steps in the right direction." Wireline profit margin was 46 per cent, "up significantly from Q1 last year as we focused on optimizing our consumer business" by removing costs where possible, he added. A year ago, the company announced a major employee buyout program aimed primarily at its residential consumer business, as part of Shaw's plan to adapt to a new generation of network technology using the Comcast X1 platform. Shaw president Jay Mehr said the new organizational structure was in place during the quarter "and we liked the results that we got" but said there were opportunities for improvement. The company's overall revenue for the quarter ended Nov. 30 was up 8.8 per cent year-over-year, rising to $1.36 billion from $1.25 billion a year ago. Analysts on average had expected a profit of 34 cents per share and $1.32 billion in total revenue, according to Thomson Reuters Eikon. As of Nov. 30, when Shaw's 2019 first quarter ended, the company had nearly 1.47 million wireless subscribers -- up 65,615 from the year-earlier quarter, but still a small fraction of what's held by any of Canada's three national carriers. Shaw's wireless revenue rose 60 per cent from a year ago to $273 million while business services revenue grew five per cent to $147 million. Revenue from Shaw's core residential services was flat at $936 million as it lost video subscribers and home phone customers, but gained internet subscribers. Mehr said that there will probably be a price increase for wireline broadband services in the spring. Telus, which is Shaw's main rival for residential customers, announced on Jan. 2 that the regular price for its internet plans will be going up on Feb. 25.